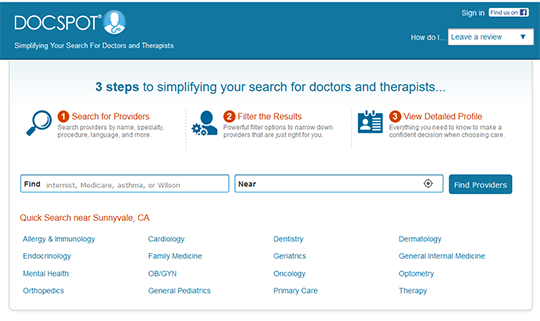 DocSpot provides an online provider directory allowing users to search providers in over 40 metropolitan areas. DocSpot gathers data from over 600 publicly available sources including state medical boards, hospital and clinic physician directories, and reviews from around the web. Information displayed for each physician includes profile details, pricing data and user ratings and reviews, Note: While their search engine can be used for free, but there is a limit on how many searches can be performed within a given time frame. Higher volume searches require purchase of a DocSpot professional subscription.